Caretaker boss Mike Flynn says Newport County will not go down without a fight as they bid to stay in League Two. Bottom of the table County fought back to win 2-1 at Crewe in Flynn's first game in charge since replacing Graham Westley. County are nine points from safety but Flynn says escaping relegation is "not impossible." "We want to fight and put the pressure on the other teams and drag them in," he said. "We're not going down without a fight, not on my watch. It's not happening. "This club deserves so much. It's been through so many bad things and the fans know what it means to me and I know what it means to the fans. "Now the players are seeing exactly what it is." Flynn said the door is also open to players who were out of favour under previous manager Westley, who was sacked on Thursday. Midfielders Mark Randall and Ben Tozer have not figured in recent weeks for the Exiles. "I'll never rule anybody out," Flynn added. 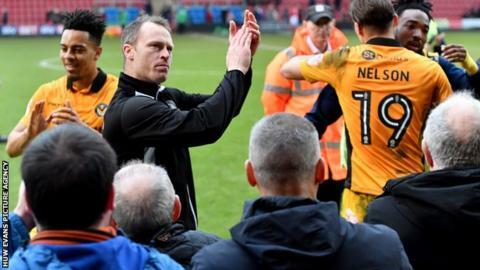 "But I've got to make sure they've got their heart and soul in Newport County because anything less would see us fall short. "I'll only include them if it's right. There were reasons why they were left out and I've got to make sure that it's right to include them again." County travel to 15th placed Morecambe on Tuesday and Flynn expects "a battle" against a side they held to a 1-1 draw at Rodney Parade in February. "We've got a tough game on Tuesday away to Morecambe and we'll prepare right and make sure that we're focused and ready to go," Flynn said. "Hopefully we'll come away with the right result and then it gets really interesting."